Traveling with your children is a wonderful way to have fun with your family but it can seem a bit daunting, whether you’ve done it before or it’s your first time. So to make your holiday as fun and stress-free as possible we’ve put together five top tips for travelling with kids of all ages. Book your flights and hotel stays as far in advance as possible. You’ll save money and ensure that you’ll have access first-come, first-serve options like flight seats, reserved meals or a family suite at a hotel. Many hotels offer family-friendly amenities from cribs and strollers to kiddie pools manned by lifeguards, and teen hangouts. Plus, when you book through DubLi.com you get Cash Back while you shop from the best travel sites in the world, whether you’re booking flights with Emirates, hotel stays at Booking.com or car rentals and excursions from Priceline.com. Booking far in advance is a great way to get the most out of your vacation. Map out your travel schedule ahead of time, gathering input from the kids. If your children are old enough, have them research the places and activities that appeal to them. By doing some investigating, you can book attractions and excursions to avoid long lines, and won’t get caught by surprise if a particular event or landmark is closed for a holiday or for seasonal hours. Also, when you plan something for everyone, the whole family has something to look forward to and will be more patient visiting other places if they know everyone will be seeing their favorite place too. For younger kids, get them excited about the places they will visit with stories and pictures, and talk them through your basic plan and give them some options to choose from, so they feel included too. Once you’ve booked your trip, it’s time to plan out your fun family activities. Don’t put the packing off until the last minute — you’re bound to forget some things while loading up unnecessary items. Your essential hand luggage list should include: hand sanitizer and wet wipes, extra clothes and plastic bags for the dirty ones, individually packed snacks and a couple of reasonably-sized toys. As soon as they are able, kids should carry their own small backpacks, packing with your help. This will help them feel responsible while saving room for the rest of the family luggage. Be prepared for the weather: If you’re going somewhere hot, then remember to bring sun protection like sunscreen and hats. To avoid having to stop at a drugstore while you’re on vacation, pack miniature toiletries and medications. You’ll be surprised by how much the little ones enjoy carrying around their own bag. 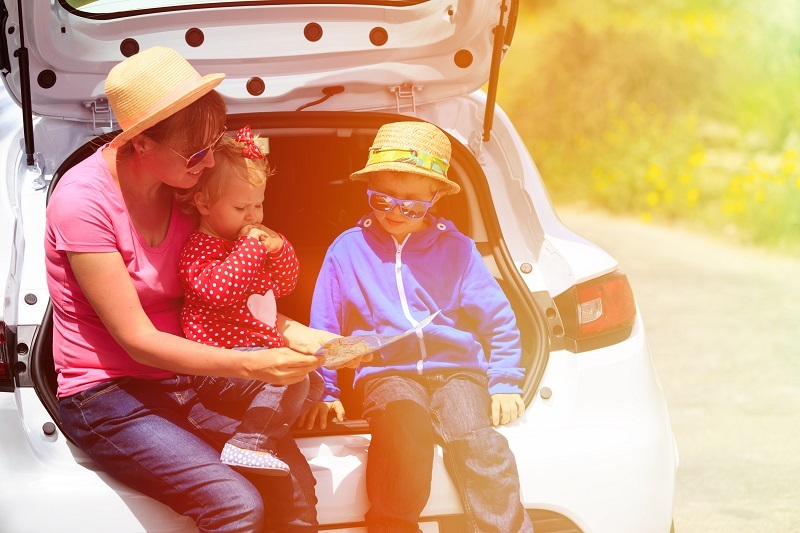 From short flights to long drives, traveling can be quite dicey for parents of young children. While your teenagers might be happy to watch a movie, sleep or play on their phone, toddlers can struggle when taken out of their routine. Load up a tablet with games and videos, and when they’re bored of that have a few small coloring books. Another fun idea to keep kids entertained all holiday is to give them a camera, preferably a robust and child-friendly version, so that they can snap their surroundings and focus on what interests them. You could also encourage them to keep a travel journal, they can sketch the sites, jot down new things they’ve tried when you relax at a restaurant, and spend time in the evenings recounting their day and adding in tickets. Not only is it fun to do at the time, but it makes a great scrapbook to look back on when they’re older. Along with the entertainment options, don’t forget to break out the aforementioned snacks. Hunger — along with sleepiness — is one of the main triggers for a terrible toddler travel tantrum! Keeping your youngest entertained in transit can be your greatest challenge. Keeping everyone safe while you travel should be priority number one. Allowing the kids to indulge their natural curiosity to explore while keeping a watchful eye can sometimes be a tough juggling act. So you have a few options to keep your peace of mind. There’s the old fashioned way of writing your number in biro on your kid’s hand so if they can’t find you, you’re just a phone call away. For younger children, kid’s wearable trackers are a genius option and there’s a variety of phone apps and funky designs ranging from $10 to $100. Using GPS or Bluetooth they can track your child from 50 meters away up to anywhere on the map, they are often waterproof and some even come with SOS buttons, alarms and two-way calling functionality. Choose which one is best for your needs and shop though DubLi.com to get Cash Back on your purchase. Our top picks are the AMBER alert GPS brand and the wide range of choices available at Walmart. Keeping everyone safe, especially in crowded cities, is the ultimate goal.